Rosie is a drop dead gorgeous girl that was also blessed with a wonderful personality. She is curious about everything and wants to check everything out at first but calms down nicely and is well behaved. When she first got to her foster home she greeted the other dogs then found the toys and started to play. Definitely a dog that will be comfortable and not phased by new things and going new places. This stunning girl is a larger girl that raced at 67lbs. Her birthday is October 15th. She is a very happy, outgoing girl that is very loving towards people and she seems to get along well with other dogs as well. Rosie loves to play with toys especially stuffed animals that squeak. Her racing owner says that Rosie and her mom both had a wonderful sense of humor and are fun dogs. Both were a joy to have in their kennel and never caused any type of problem. Rosie did fantastic at her first meet and greet and would greet everyone she saw. She liked children and adults and would bump them with her nose to get more petting if they stopped petting her. Rosie was a good racer but was retired because of a limp that would appear off and on after some races. It stems from an old injury to her hock that she had as a puppy. It has been looked at by our vet and won't effect her life as a pet since she won't run as hard playing as she did at the race track. She loves to run and play with other dogs and that doesn't seem to bother her or cause any limping. Walks don't bother her either and she would love to go for walks with her new owner. 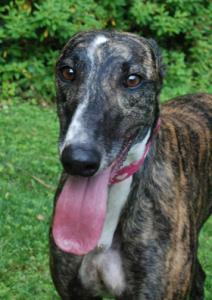 Rosie is a great girl that would be good in just about any home or situation. Rosie had a wonderful life with her family and crossed the bridge on Dec 1st 2017 due to cancer. RIP Rosie you will be missed.